← BEHOLD! The awesomeness of dehydrated strawberries. This was such a well written post I just loved it, I would really like to try this! It come at the right time of the year also, so many time I read things like this in the dead of winter, just to completely forget about it when summer rolls around. Thank you Mitchell! I try to keep my posts seasonally appropriate, which isn’t hard to do since I mainly eat what I’m growing or what is currently in season. I have two more garlic scape posts to write this week, then I’m done till next year. Nothing is more frustrating than finding a great recipe at the wrong time of the year! Julia, I don’t blame you! I love my scapes and if I only had one to use I’m not sure what I’d do!! This IS wonderful! I always have a surfeit of herbs. Looking forward to trying this recipe. Thanks for sharing! I assume that this can be used with many vegetables as well? Thanks for stopping by Becca! You can preserve just about anything with salt; traditionally it was done with meats and fish before the use of refrigeration. I’m looking forward to trying it with a few herb blends! Last summer I chopped some of my garlic scapes….very finely….and mixed them with butter. I plopped them onto a wax paper lined cookie sheet with a melon baller and froze them. Once they were frozen I tossed them all into a ziploc freezer bag and put them back into the freezer………Thanksgiving rolls around and we have wooooooooonderful garlic butter for out mashed potatoes. ……and the leftovers work pretty good for making scrambled eggs! That is a great idea Jill! I have a few scapes left over and need to clarify another batch of butter, so I may give your garlic butter a whirl! Thanks for sharing! I have clean, glass peanut butter jars with screw on lids. Will these be adequate? Absolutely! 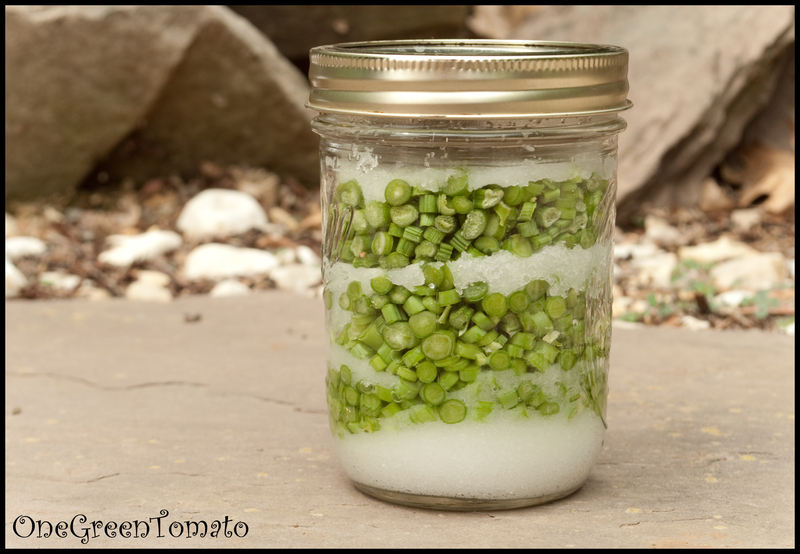 If the recipe called for canning then no, but since you are only creating a brine go for it!